We have a past record of sales in the United States and Europe. In Japan, we produce the packages for the major food-processing company (which is a public-listed company), the famous traditional Japanese confection store and also for the mail-order gift of the very popular ranch, and which proves the high quality of our products.. In this industry, our company has a reputation as a manufacturer which can solve the problems of other companies having not addressed. 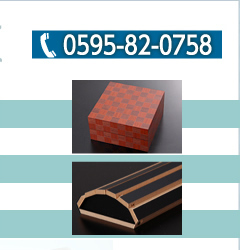 We would like to offer you the proposal of the best materials and shapes upon request. Please feel free to consult us concerning the cost as well. Please make sure to contact us by e-mail. Please note that a few days may be needed for a reply.